Is Infinera Corp. Destined for Greatness? Telecoms are finally starting to spend again, and Infinera (INFN) could see its stock surge if it can attract as customers. Investors love stocks that consistently beat the Street without getting ahead of their fundamentals and risking a meltdown. The best stocks offer sustainable market-beating gains, with robust and improving financial metrics that support strong price growth. 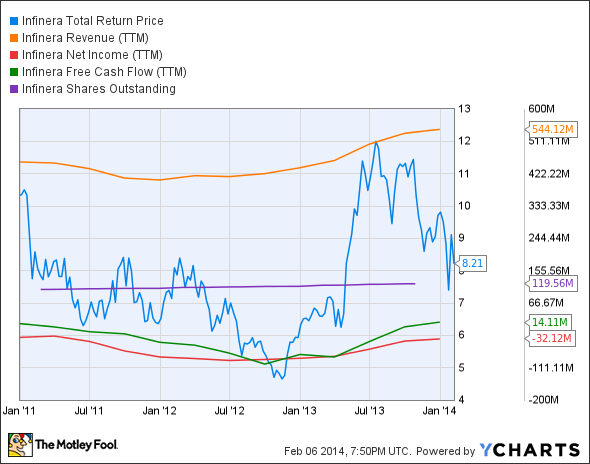 Does Infinera Corp. (NASDAQ:INFN) fit the bill? Let's take a look at what its recent results tell us about its potential for future gains. INFN Total Return Price data by YCharts. Source: YCharts. * Period begins at end of Q4 2010. 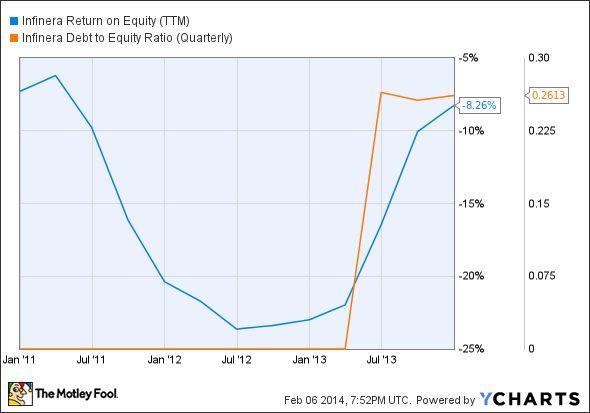 INFN Return on Equity (TTM) data by YCharts. Things don't look too good for Infinera today as it's only earned three out of seven possible passing grades. Over the past three years, Infinera's revenue has only grown modestly as U.S. telecom companies have been tightening the belt on their capital expenditures. However, multiple metrics -- free cash flow net income, and revenue included -- have all been on the uptick since the beginning of 2013, which could result in a much better score next year if the trend continues. Can Infinera sustain its recent progress and become a market darling again? Let's dig a little deeper to find out. Infinera delivered better-than-expected revenue in its fourth-quarter results, and net income improved to breakeven as compared to a loss in the year-ago period, thanks to rising demand for its next-generation DTN-X platform. Management believes that DTN-X should continue to drive greater profitability as more telecoms upgrade to lightning-fast 100-gigabit optical networks. Fool contributor Dan Caplinger notes that the telecom industry has begun to improve in the wake of major consolidative deals among major U.S. carriers, which should help Infinera amass new DTN-X orders. However, the company also faces plenty of competition from established global networking leaders Alcatel-Lucent (UNKNOWN:ALU.DL) and Ciena (NYSE:CIEN), which each has its own 100G offering and a great deal of experience in past telecom-equipment price wars to draw on. Fool contributor Kevin Chen notes that either Infinera or Ciena could win a multimillion-dollar, three-year optical-networking deal from Level 3 Communications (NYSE:LVLT), which is looking to abandon its business relationship with Huawei due to strong opposition from the Obama administration and House Intelligence Committee Chairman Mike Rogers. In addition, Verizon, AT&T, and other U.S telecom companies have been mulling a bid for more spectrum to broaden the reach of their 4G networks, which will further boost demand for optical-networking equipment. Over the past few months, Infinera has already moved on contracts for several major upgrade projects in the Asia-Pacific region, Russia, and in the U.S., which should positively impact both top and bottom lines. Australia's Telstra has joined hands with Infinera to upgrade multiple ultra-long-haul submarine cable routes in the Asia-Pacific region, and Russia's Rostelecom began its installation of Infinera's DTN-X platform to expand the reach of its network. Meanwhile, TeliaSonera International Carrier completed the installation of the DTN-X platform in a major network expansion, adding an additional 11,400 miles of fiber cabling to its existing North American telecom network. Today, Infinera has some of the qualities that make up a great stock, but no stock is truly perfect. Digging deeper can help you uncover the answers you need to make a great buy -- or to stay away from a stock that's going nowhere.